This is Book 2 of Love on Life’s Zip Line. Ashley is savoring being single in the city that she is claiming for herself one delicious day at a time. She is in control until handsome medical student Mark points at her and says, “You, call 9-1-1 now.” She makes the call and watches him give CPR to a passenger on their NYC subway train. He is focused on his career and haunted by the death of his lover. 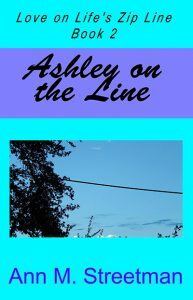 Attracted to him, Ashley wants to help him, but does not want to get swept into a relationship she’s not sure about. She discovers that love on life’s zip line is the messiest and most complicated experience of all, but it is oh so worth it.